What is another word for denounce? To proclaim in a threatening manner; to threaten by some outward sign or expression. giving piece of one mind. go one on one with. rebukes, blasts, slashes, raps, hits, condemns. 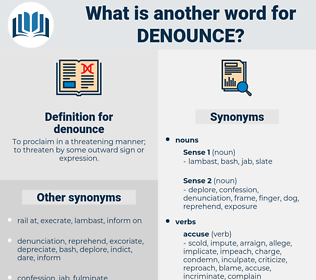 Renouncing, Criticising, accusing, Repudiating, Rejecting, Censuring, disclosing, Reprimanding, protesting, Exposing, Addressing, Blaming, withdrawing, Alleging, telling, Terminating, challenging, showing, leaving, Quitting, Claiming, exiting, raising, naming. criticise, expose, reject, repudiate, report. criticise, expose, terminate, uncover, withdraw, reject, disclose, repudiate, dismiss, cancel, report, abandon, indict, highlight. renounce, deplore, convict, complain, stigmatise, condemn, reprove, condemns. welcome, free, approve, applaud, flatter, exonerate, compliment, exalt, laud, exculpate, praise, commend, allow, ignore, cover. cite, venerate, extol, salute, eulogize, honor, consecrate, hail, pardon, hallow, acclaim, endorse, bless, tout, absolve, recommend, applause, glorify, justify, revere, sanctify, acquit. They're going to denounce the administration. deimos, dominick, dinky, dinge, Den Haag, danish, dunce, dmus, deadening, damask, dung, dominos, dehumanise, dengue, demise, dumuzi, dense, dynamise, dawning, damage, dank, demagogic, DMZ, demoniac, deaminize, Dominicus, demagogy, dominance, dynamics, dieting, dink, downy chess, dunnock, dance, deinonychus, deionize, diatomic, demonic, dinghy, dining, dimness, donnish, damning, dominica, dominique, dynamic, dowdiness, doting, downing, dimash, demonize, domingo, dionysus, dominic, ding, dominoes, dinka, demonise, dowding, demagog, Dayton Axe, damascus, downy ash, downiness, dating, de-iodinase, dominus, dehumanize, death mask, deadness, diatonic, Dayton Ax, dingo, dunk, dyeing, data mining, dynamize, dinkey, danseuse, diminish, danaus, dionysius, dong, dae-han-min-gook, dimaggio, danzig, donkey, dumas, dying, dingy, demagogue, demeaning, doings, dionysia, damages. decry, excoriate, rail, reprobate, condemn, objurgate, fulminate. criticise, announce, denote, pick apart, knock, criticize.